Follow the Pilgrim on the path to Mecca, capturing wild camels, goats, donkeys and horses on the way. The journey is harsh, the desert shifts, and you can't let yourself get too far behind or you will be lost in the desert! In the cities along the way you can sell your animals and find new handlers to help you capture more. 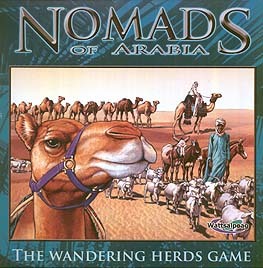 When you reach Mecca, the Nomad who has succeeded in capturing and selling the most valuable animals will be able to make the largest offering and win the game!